As every schoolchild knows, the ostrich (Struthio camelus) is the world's biggest bird. It's also the fastest bird (on the ground), and has been clocked running at speeds over 30 miles per hour. 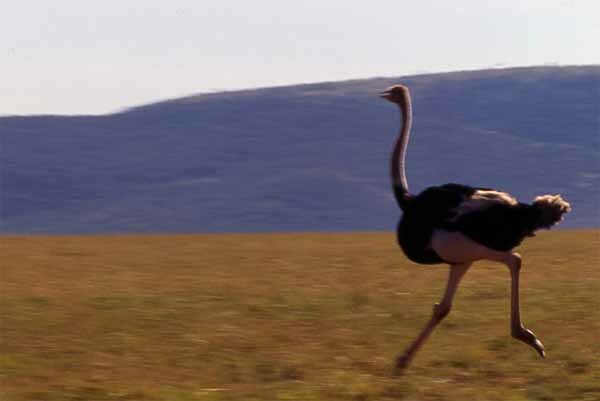 Adult ostriches are big and mean enough to be immune from the attentions of most predators. Chicks or old birds may fall prey to lions and other big cats, but the eggs are virtually invulnerable. These birds are quite numerous today, having recovered well from near-disaster in the early part of the twentieth century when many were killed for their feathers which were used in hats.